>>> journalist david wise has written a dozen books on the subject with one on chinese spies coming out next year. david, good morning to you. >> although there is no official confirmati confirmation, assuming the trade goes through, there are reports it could take place today. what does that say to you? >> well, it says to me it's a throwback to the cold war . there were famous exchanges during that period. the most famous was a man named rudolph abel who was posing as a photographer in brooklyn. he was traded for gary powers , the pilot flying a cia spy plane over russia . they were traded on a bridge in berlin in 1962 . >> does it suggest that the u.s. doesn't believe the alleged spies have much information? >> well, it doesn't appear that they did get very much. the fact that they were not charged with espionage suggests that nobody in the fbi saw them receiving a classified document from some government official . >> there was a lawyer who negotiated for the state department in the 1970s and '80s. he said the u.s. never would have negotiated this back then unless the suspects had been convicted or served time. what has changed since then? >> what has changed is that the obama administration wants to, what they call, reset relations with russia and this is just an irritant. what do you do with these people? what do you do with anna chapman who's like a character out of "from russia with love" a james bond fan. throwing them in jail may not be an advantage with relations. >> you talk about anna chapman and a throwback to '50s. the fact that the russian spies didn't seem to pose a threat suggests a question of why were they here in the first place. >> you know, it's like fishing. if you put out the line behind the boat and you troll you may get nothing but sunburn, but you may get a strike, a big fish . i'm sure that's what they were hoping for. >> yeah. as pete williams reported, for this swap to take place all would have to plead guilty and at least two say they have no intention of making a deal. could that potentially throw this up in the air? >> well, the deal isn't set. sometimes the prospect of going to jail clears the mind very quickly. they could change their mind. >> also, finally, you know, this whole notion of the fake names, fake passports, secret code words, invisible ink , is that how undercover operations are run these days? it sounds like such a throwback. >> well, the russians have done illegals for years. what's new is the size, the scope. maybe two or three were sent. but 10 or 11 is unusual. they have always done it. why stop now just because the cold war is over? >> thank you for your perspective this morning. 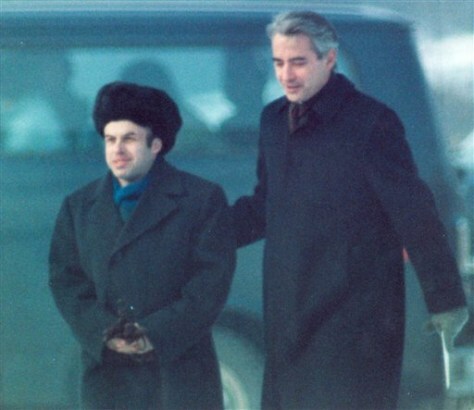 Soviet Jewish dissident Anatoly B. Shcharansky, left, is escorted by U.S. Ambassador Richard Burt after Shcharansky crossed the border between East Germany and West Berlin at Glienicke Bridge during an East-West spy and prisoner exchange on Feb. 11, 1986.